There has been an extraordinary amount of rainfall on the western slopes of the Washington Cascades, and the origin of the heaviest areas is the Puget Sound convergence zone, coupled with the return of wet weather to the region. 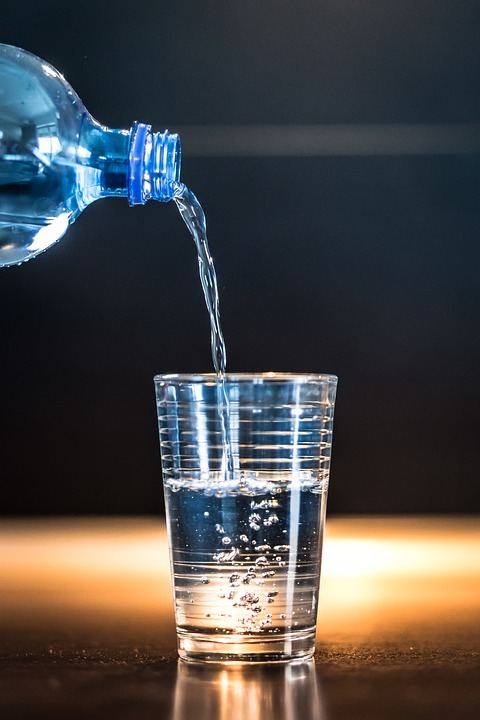 As a result, reservoirs providing water to Seattle, Everett, Tacoma, and the Yakima Valley are rapidly filling, further lessening any water issues this summer. Many of you have some acquaintance with the Puget Sound convergence zone, which is associated with westerly/northwesterly air flow that is deflected around the Olympics and then converges over Puget Sound (see figure). Where the air converges, one gets upward motion and enhanced precipitation, as illustrated by the radar image yesterday at 415AM. Note the relatively narrow area of rainfall stretching southeastward from the eastern side of the Olympics--that is the result of the Puget Sound convergence zone. But there is an important subtlety apparent in the radar image: the impact of the convergence zone extends beyond the lowlands of Puget Sound, well into the Cascades. Frequently, the enhancement of precipitation extends to the Cascade crest and beyond. 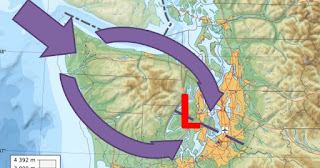 Puget Sound convergence zones are most frequent during the spring, since this is the time of the year when westerly/northwesterly flow is most often observed. And the unstable air of this season, produced by the increased warmth of the sun, produces a lot of precipitation for even small amount of low-level convergence. During the past week, we have had several convergence zone events that have produced HUGE amounts in the central WA Cascades. This is illustrated by the 1-week totals ending this morning. 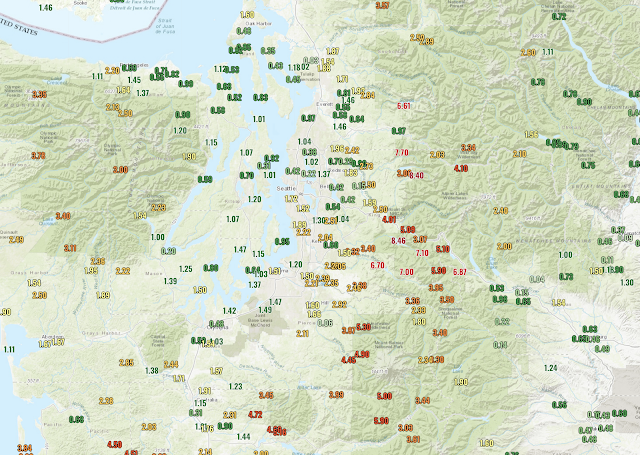 Several locations on the western side of the Cascades near Snoqualmie pass have gotten over SIX inches of precipitation. Some 7-8 inches. Sometimes the convergence zone sets up over Snohomish County and you will notice some big values up there as well. Worried about water in Seattle? Here is the rainfall at Chester Morse Lake--the largest reservoir for Seattle--over the past week. About 8 inches. The impacts of the convergence zones have also extended across the Cascades, helping to fill some of the key reservoirs of the Yakima River, such as Lake Keechelus (see below), which was below normal, but will soon reach normal levels during the next week. The latest model runs suggest the bountiful precipitation is not over, with substantial precipitation over the Cascades and Olympics. The forecast for the next 72-h shows several includes at higher elevation...some as high as 2-4 inches over the period.. You might want to delay any hikes on the western side of the Cascades or head over to eastern WA. "And as a result, the lake level has gone up substantially..."
Which will then be dumped back out over the next week (which they have done what, 8 times this year?) to make room for the continued and impending melting snowpack in the watershed. Seattle was 100% done on this at the end of February with the snowpack and reservoir heights. The only possible issue after that time would be a rapid and early meltout (which we have not had, at all). It was never an issue of precipitation. In fact there still is the risk (which declines every day as we approach June) of an early meltout/low precip with an unusually hot/dry spring... but that risk is always the case here, every year. Btw, speaking of snowpack - Alpental had over 2.5 feet of new snow at the top the last couple of days. 14 feet of snow up there and people want to talk about a water crisis. 85% in the upper Columbia (on a map we know is likely under reporting swe) and where someone was just posting (with fear!) that stream flows there were predicted to be one of the worst in history. I do not understand it - except in terms of politics. Then I understand it. And it really is troubling. Now that is an issue Cliff I would like to see you continue to pursue. There's lots of water. The only problems regarding water shortages we will run into is if the next few months are extraordinarily dry AND the fall rains are delayed. But there's no guarantee that's going to happen so no need to have unfounded drought fears. Furthermore the summer drought and wildfire situation is also dependant on the rainfall in May and June and also how early the snowpack melts and of course how hot and dry the summer months are. If we see normal rainfall for the rest of the spring and summer than there should be no problems with wildfires either, over and above a normal year. And a normal summer in these parts is very dry. The media loves to hype up the drought rhetoric and the climate change alarmists love to have a "we told you so" moment when it comes to anything that could be (but likely wasn't) caused by climate change. They do the same thing with hurricanes in the south. You read some of the articles and you'd think that anthropogenic climate change is causing more hurricanes and for them to be more intense. Of course we know it's not the case. The most intense on record was way back in 1979, Super Typhoon Tip. The early 90s saw massive hurricanes in Florida like Hugo and Andrew. Major hurricanes and intense weather events, drought, wildfires, floods etc, of varying intensity and cycles all also occurred long before industrialized humans had any effect on the climate and these phenomena will still occur long after human beings are extinct and these events will hit to the same varying degree of intensity they do today. There’s not a single important SNOTEL site north of I-90 above 75% with most around 50 to 60%.And given this is the time of year they peak, its something to be very concerned about. A declaration in the media was definitely justifiable. In the Eastern Pacific alone, 13 out of the strongest 20 hurricanes on record have occurred since 2000. Climate change is here. Lots of water now in western WA equals lots of growth ~ grass. weeds, brush, trees (evergreen and deciduous), so lots of tinder in the dry summer months. It will take many years for our forests to recover from over-harvesting, if ever. Currently most forest managers (Washington State Dept. of Natural Resources and privately owned forests) are working on extracting profits every 10 - 20 years by removing trees as soon as they are big enough to turn into lumber or chips. For the first 4 or 5 years, the juvenile trees are overwhelmed by the grass, weeds and brush. They can't compete, many don't survive, and the tinder takes over. Lots of tinder lurking everywhere. No easy answers. And too much demand on our limited water resources. We can't store it in ponds and lakes. Their capacity diminishes when we try. They fill with sediment carried by the water. Too many wells are draining aquifers faster than they replenish. Too many people. Humanity is an infestation of mother earth. "We" may not have a water shortage problem, but a few more bone dry and higher than normal temps (for weeks) is stressing the entire regional ecosystem. Our native trees and plants can handle our historical pattern of dry summers, but they're not cacti. Too rapid a meltout is also bad - for the critters, fishies, as well as the native flora. I'd love to see graphs comparing the temps and the rainfall from May thru September from 1980 thru the present, which I think would likely prove my point, ie, it's not just about how much water is in the reservoirs. I wouldn't be surprised if in the next 10-20 years we begin to see seriously large fires in the Olympics. You are correct! The Eastern slope of the Cascades is experiencing a trend towards more frequent and severe drought conditions. Higher temperatures increase the rate of “desiccation” as Cliff puts it. The rate at which water travels upward into the atmosphere (evapotranspiration) has increased. Precipitation trends (downward transport) have not kept pace. Google NOAA’s interactive product “Climate at a Glance” to see trends for the timeframe and location you’re interested in. The 1 April 2019 snowpack averaged over the Pacific Northwest was close to the longterm mean. ??? She wanted to know temperature and prescription trends for the months June through September, 1980 to present. April 1 is generally the PEAK snowpack. To see if it’s been melting earlier, you need to look at trends for May, June, and July, or simply take the average meltout dates for the various snotel sites around Western Washington. You’ve done this and found no evidence of early melt? Again, citation (all the sites please, not just high elevation). I used all 38 snotel sites which had snow remaing on June 1 all 31 years from 1984 - 2014. Meltout date is defined as the last day with 2 inches or more of snow water equivalent (SWE). You came back with just 38 out of 222 sites.....selected from the entire PNW rather than from Western Washington. If you asked me to guess why those 38 sites still had snow left on June 1st, while the others didn’t, I would say they are probably at higher elevations.